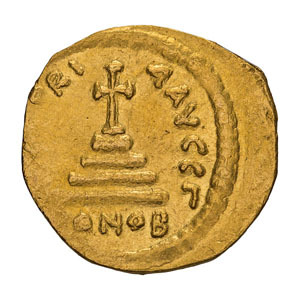 Tiberius II. Solidus, 4.42gg. (6h). 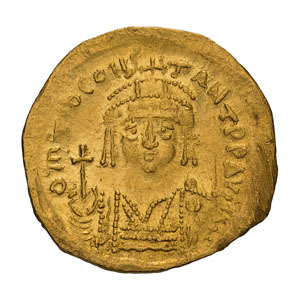 Constantinople, 578-582 AD. Obv: DM Tib CONS - TANT P P AVI Bust facing, in cuirass and crown with cross on circlet and pendilia, holding cross on globe and shield with horseman device. Rx: VICTORI AAVCC Γ Cross potent on four steps, [C]ONOB below. Berk 76. DO 4c. MIB 5. Sear 422. Mint State. Ex Berk 167, 3 December 2009, lot 29.